Two of the yummiest foods combine for one interesting t-shirt. Pizza for dinner and cake for dessert, instead, how about a pizza cake? This t-shirt has a simple design. It has a picture of what looks like a cake, but the icing on top of the cake looks like a pizza.Voila! Pizza cake! it also has written in red and yellow the words, “life is a pizza cake”. The size run of this t-shirt includes Small, Medium, Large and Extra Large and is listed in men’s sizes. 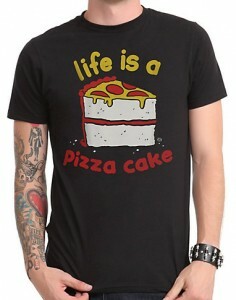 It may be a bit strange, but everyone will enjoy your Life Is A Pizza Cake T-Shirt. Yummy cupcakes that is what i want. 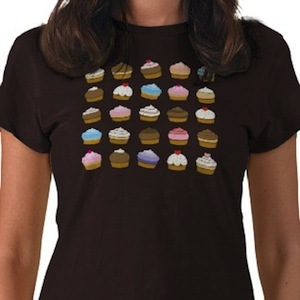 This t-shirt shows you 25 different but yummy cupcakes that you can’t eat because they are just printed on the t-shirt and are not real. But any ways this t-shirt looks nice and the cupcakes make everybody smile. 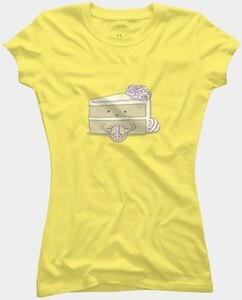 Time for cake with this Cupcake Pattern T-Shirt. A fun t-shirt for everyday. This blue shirt shows two boxes next to each other. The first one shows you jumping out of a plane with your parachute and the words “You live for the thrill” and the other box shows me falling through a portal on my way to some yummy cake and the words “I live for the CAKE”. 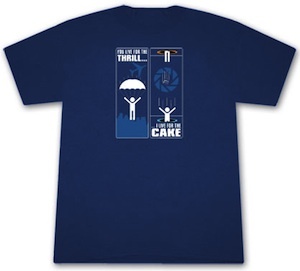 Go check out this Cake Portal T-Shirt. 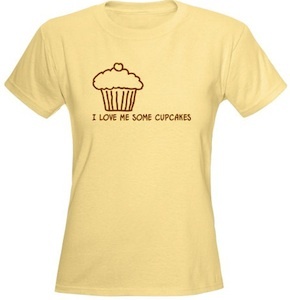 “I Love Me Some Cupcakes” is what this yellow women’s t-shirt says. And who doesn’t want to have some fresh baked cupcakes? So cupcakes lovers go check all styles and colors and order your own I Love Me Some Cupcakes T-Shirt.